Put Cassia Bark, nutmeg, ginger, garlic, coriander root, white peppercorns, star anise, chilli, the green parts of the spring onions, palm sugar, onion, Shao Xing wine and chicken in just enough water to cover. On medium high heat bring to the simmer then turn down heat to barely simmering. Poach on a very gentle heat with the lid on for 40 minutes. Switch off the heat and leave in the pot with the lid on also, for another hour to finish cooking. This, by the way, is the best way to cook a whole chicken and still retain amazing succulence. When cool enough to handle, remove the chicken from the liquid and shred the meat into long attractive strands, and keep aside. Strain all the flavourings from the soup and heat when ready to serve. To make the paste, slice the white part of the spring onion thinly and place in a bowl. Add the fresh red chilli to taste, also sliced thinly. Add the coriander, eschallots, tomatoes, soy sauce, hoisin and oyster sauce and mix together. 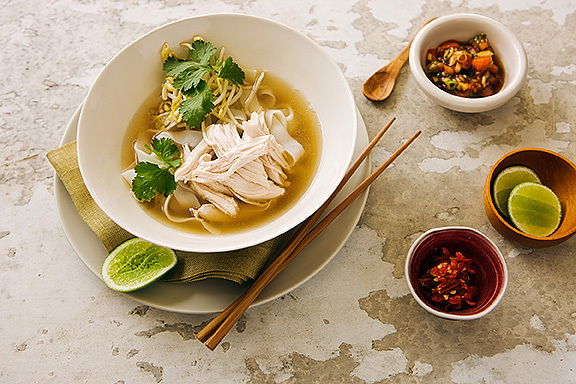 To serve put the hot noodles in a large bowl, add some chicken, then add some of the paste, and ladle the very hot soup stock over. Squeeze a lime wedge over and top with some fresh chilli.